Pistoia and its surroundings have an ancient history, reaching the top of their splendour during the Middle Ages, when many noble families decided to build their villas and manor houses in the town and on the surrounding hills. In fact many villas for rent in Tuscany are located in this area. A number of these mansions, perched on the gently rolling hills, later became wine estates for the Chianti “Montalbano” production. In the last decades some of them have been renovated, so that guests can choose between many striking accommodations in the Pistoia area. Regarding the history of the town, Pistoia, was a Roman colony, used as military stronghold against the Ligurian tribes living in the nearby Apennines. During this period, Pistoia developed because of the road network built by the Romans. In fact the opening of a new stretch of Via Cassia (the consular road linking Rome with the Etruscan cities of the interior and Lunigiana) made it a junction of primary importance. Recent archeological investigations in the area of the cathedral San Zeno have revealed the continuity of the urban strata, spanning more than twenty centuries of history. Actually it played in the 4th and 5th centuries an important role at the time of barbarian invasions, putting up a long resistance to the advance of Longobards. The economic success certainly stemmed from its position in the road system, but the abundant supply of water and the timber of the nearby mountains played a fundamental role in the emergence of manufacturing activities such as wool, paper, wood, still flourishing today. Nor should we forget the smelting of iron ore from Elba isle, already under way in the Etruscan period and elevated to the status of a true “industry” under the Medici. However the precocious “industrial” vocation was not matched by an adequate political stability and the city after the 13th century golden age lost its political influence, falling under the sway of Pisa, Lucca and finally Florence in 1530. The shared artistic heritage is quite evident in the Romanesque style of the Pisan-Luccan style of the cathedral of San Zeno, hub of the city's memories. Travellers in the past have remarked on the quantity and quality of the sculptures and carved decorations which appear to be a distinctive trait of religious architecture in Pistoia, difficult even to hint in a such scanty amount of place. Let us remember the cathedral portico decorated by Andrea della Robbia, the numerous lintels carved in relief by Gruamonte, the pulpits of great value by Giovanni Pisano or churches like Sant'Andrea, San Bartolomeo in Pantano, San Pier Maggiore, San Giovanni Fuorcivitas, San Paolo, San Francesco and the later basilica of the Madonna dell'Umiltà, whose powerful impact on the city's skyline is due to the imposing dome built by Vasari in the 16th century. Last but not least the former monastery of Sant'Antonio Abate, splendidly frescoed in the 14th and 15th centuries which now houses the center named after Marino Marini, the important 20th century sculptor, born in Pistoia and much appreciated by international art collectors such as the American Peggy Guggenheim. 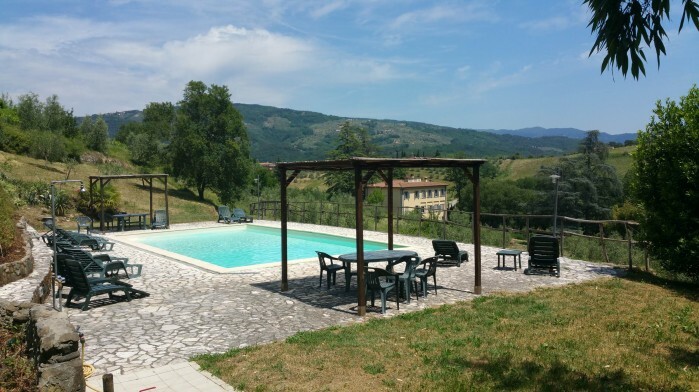 This holiday farmhouse is part of a wine estate, located between Florence and Lucca, at 1 km from the village of Masotti and is surrounded by a luxuriant countryside with vineyards and olive groves. The owners’ family farmhouse and a small farmer’s house have recently been renovated and converted into apartments for holiday rentals. They consist in 4 flats in the main house plus a romantic cottage in a detached building. At guests disposal a swimming pool (12x6 m, open Jun-Sept), washing machine, internet Wi-Fi connection and barbecue for al fresco dining. The estate’s owners organize wine and olive oil tastings for those interested. The nearest shops, restaurants and train station are in the village at 1 km. Lucca is at 37 km, Florence 41 km, Pisa 51 km, the Versilia coast at 60 km, while the relaxing spa town of Montecatini is a just 10 km. An ideal position for those wishing to spend a quiet vacation in the countryside and for those who have cultural and art interests. 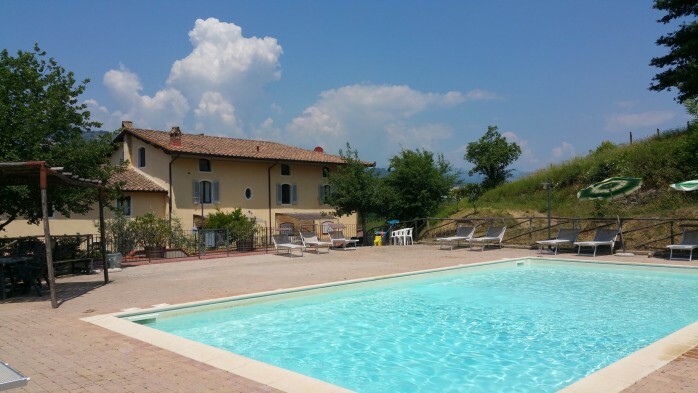 Located in a tiny, old hamlet at 740 m above sea level, and 15 km from Pistoia, these holiday apartments for rent in Tuscany are in a quiet area, far from the madding crowd, with a spectacular panoramic view. Perfect for a relaxing holiday surrounded by nature, the property has large lawns surrounded by flowerbeds, a children’s playground, a barbecue and a swimming pool (11x5). Also available internet connection, laundry and, new: Jacuzzi and sauna (fee applicable). Nearby there is a stream along which one can take long walks. Typically Tuscan, the owners are a lovely couple, very warm and attentive, as well as generous. These holiday accommodations consist of 6 apartments, tastefully furnished and each with a private terrace/garden area, which can comfortably accommodate up to 24 people. In the surroundings one can visit medieval villages and an ancient factory, where ice was once made, called Le Piastre on the river Reno. These holiday apartments with swimming pool in Tuscany are in an ideal position for daily trips to the art cities of Florence, Pisa or Lucca. The nearest shops and restaurant are at Le Piastre at 1,5 km. 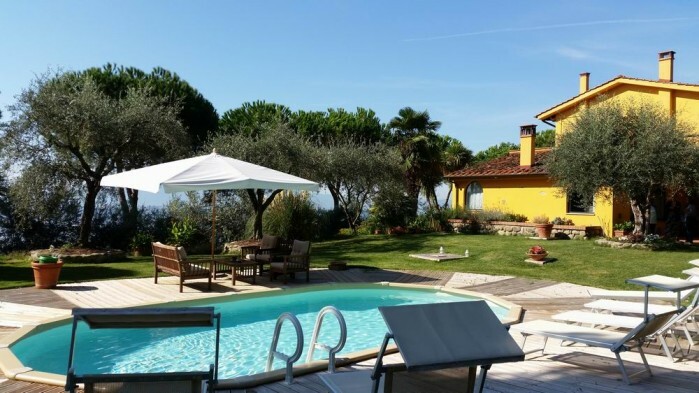 This stunning and elegant villa is located at 800 meter from Uzzano, a tiny medieval hamlet between Lucca and Pistoia. The village dates back to the 11th century and enjoys amazing views. In Uzzano there is a small food shop, and the nearest restaurants are at 1,5 km. Other shops and supermarkets are at 3-4 km. The 19th-century villa is a country house set in a dominant position on the hillside and from its terraces and garden one can enjoy a breathtaking view over the territory up to Lucca as well as a view of the village of Montecarlo, famous for its excellent wines, sitting on the opposite hill. The house, surrounded by olive trees, pine trees and cypresses, is in a very quiet position, ideal for a relaxing holiday, and has a very large fenced garden, where there is a swimming pool (4x3 m, open May-Oct, 1,30 mt deep) and a 2 m Jacuzzi pool. The house is divided in two sections. Entrance through an imposing remote controlled gate, to the car park and to a small part of the villa where the owner lives, a nice, old lady who won’t disturb your privacy unless you need information, assistance, or require a delicious homemade meal. This large 19th-century villa is located near Serravalle (3 km), a small medieval village between Florence and Pisa. The village is situated on the top of a hill, and has 2 towers with a stunning view (one towards Florence and the other towards Pisa); thanks to its two towers the settlement had a strategic position during the Middle Ages. Located in a quiet position, in the middle of a large park with century-old trees, the villa, 600 sqm, with private swimming pool (12 x 6 m, depth 90-140 cm, open June-Sept, with shower), is vast and has over 20 rooms. The large gardens and outdoor spaces are ideal for a relaxing holiday, and for a walk in the nature; you can also relax at the gazebo overlooking the olive groves, enjoying a good glass of wine, while preparing your barbecue. Owners are available if you want to visit the wine cellar of the estate and taste the excellent wine or olive oil produced here. On request you can also have a cook, pre-arrival grocery service, housemaid, private driver. Distances: nearest shops, restaurants and train station 1 km; Lucca 37 km, Firenze 41 km, Pisa 51 km, sea or beach 60 km, Montecatini Thermal Baths 10 km. The villa is on 3 floors, furnished with original pieces and taste, and can host up to 19 people (7 bedrooms + sofa beds). At guest’s disposal internet Wi-Fi, Sat-TV.